My first Mother's day would not have been complete without eating a delicious cheeseburger. Ryan, me, and Mason headed to Harry's Tavern & Grille for lunch since Mason is usually cranky during the dinner hours and we wanted to spare other diners possible crying and tantrum throwing. Ryan was nice enough to appease me and let me order for the both of us so that we could split 2 different burgers. 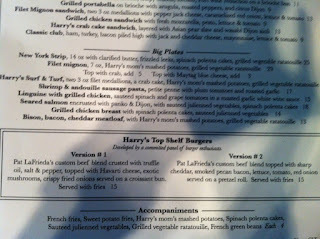 Both burgers were Harry's Top Shelf Burgers. 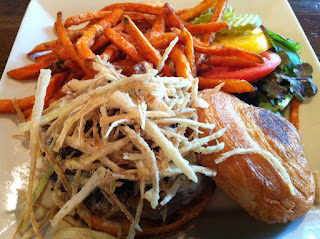 One burger was ordered with regular french fries, the 2nd with sweet potato fries. Version #1 - Pat LaFrieda's custom beef blend crusted with truffle oil, salt & pepper, topped with Havarti cheese, exotic mushrooms, crispy fried onions served on a croissant bun. Pat LaFrieda Meat Purveyors has a lifelong history of serving New York City and the surrounding area. Being family-owned and -operated for our entire existence has enabled us to maintain consistency, and our customers are habitual. We are federally inspected by the USDA, which means that agents have an office in our building, and are hands-on in ensuring that all of our products meet the most stringent and most updated guidelines. This is a priceless endeavor that should not be overlooked. Today, LaFrieda Meats boasts an impressive 600 customers and is rapidly growing. The business is up seven days a week around the clock. That unmatched LaFrieda work ethic not only gained notoriety but earned respect. So much respect that in 2003 New York City renamed the street where the shop was located to Pat LaFrieda Lane after the first generation of LaFrieda meat men. LaFrieda has been featured in such esteemed outlets as The New York Times, New York Magazine, Men's Vogue, Saveur, The New York Post, and Time Out New York. He has also appeared on The Food Network, Martha Stewart, ABC News Nightline, Anthony Bourdain's No Reservations, and The Mike Colemeco show on PBS. Back to the burger review ... it.was.incredible. The meat was perfectly seasoned and cooked at a medium temperature (per the chef's recommendation). The croissant bun was an excellent choice for the decadence that was held between its top and bottom. Havarti cheese is one of my favorite types of cheese and was melted all over the meat. I'm not sure what kind of mushrooms made up the "exotic" mushrooms, but they tasted meaty and earthy. The crispy fried onions were a little oiler than expected but not enough to negatively impact this experience. At $15 it is quite expensive for a burger in Charlotte (I wouldn't blink paying this amount at a restaurant in NYC), but is worth every penny for a "nice" lunch or dinner. Version #2 - Pat LaFrieda's custom beef blend with sharp cheddar, smoked pecan bacon, lettuce, tomato, red onion, served on a pretzel roll. This burger was not AS spectacular as Version #1. Don't get me wrong, it was still a good tasting cheeseburger. The meat patty was not as well seasoned as Version #1 and just tasted like, well, meat. 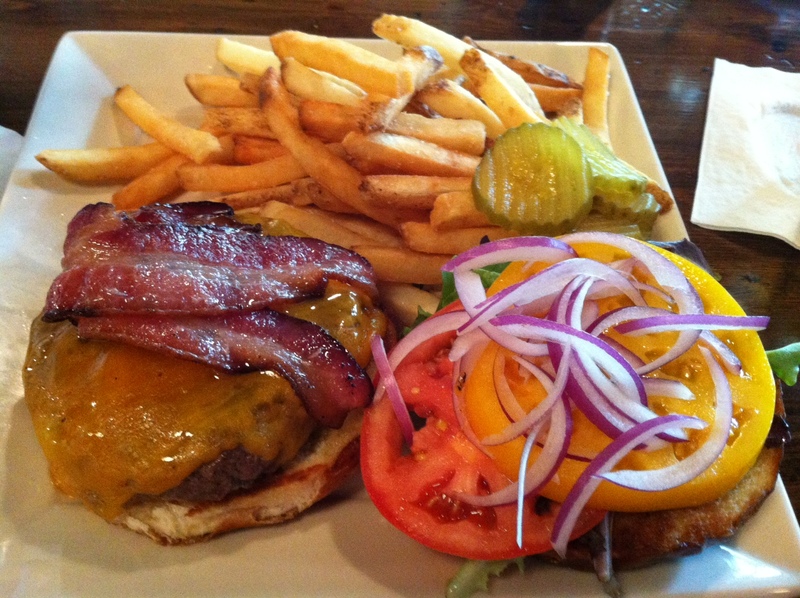 The bacon was really greasy and made the burger a mess to eat. Although the flavor of the meat should have been enough to flavor the entire burger, I would've preferred some sort of aioli added to it. The pretzel roll was a nice change from the ordinary sesame seed buns that are often used for burgers. Overall both burgers did their jobs of filling us up during lunch. 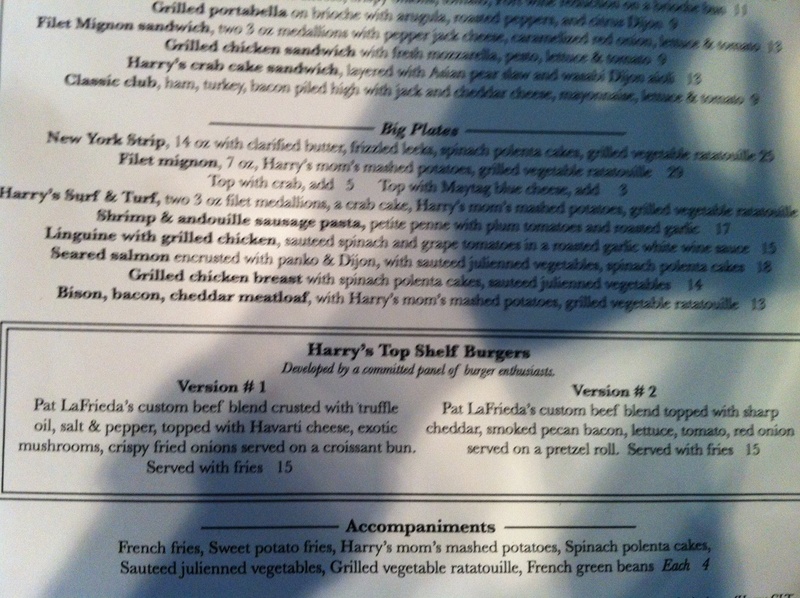 Version #1 was definitely superior and MAY get us to drive down to southwest Charlotte again to eat at Harry's. I just wish their location was closer to where I live since it is a really nice brand new restaurant with an interesting menu. Unfortunately, in my opinion, Version #2 was not worth the $15 but could be improved with a more flavorful burger patty.